The picture at the head of the is site is a genuine Turner Manufacturing Company L60 show engine which I have the good fortune to own. 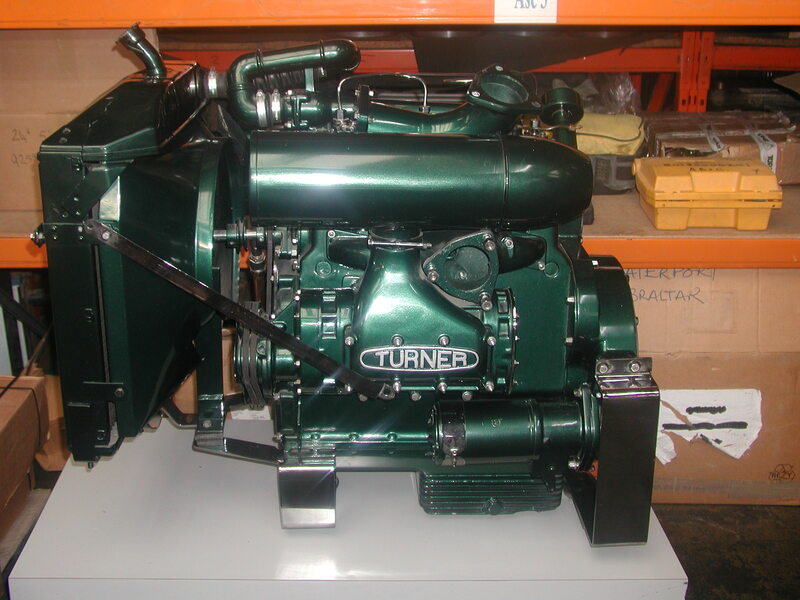 For reasons which aren't clear the firm Turner Engineering, based in Glasgow, used to have this engine in the foyer of their office until a point where it was re-furbished and a decision was made that the engine was then surplus to their requirements. There is no connection between the two Turner companies other the the name Turner. As far as we can tell it is a complete functioning engine. My own personal interest stems from my enthusiasm for Series One Land-Rovers and the 'discovery', well over 20 years ago now, of a Turner (List/ Jenbach) L40 two cylinder loop scavenged diesel engine lying under a tarpaulin at the home of a long established West Yorkshire Land-Rover enthusiast. I started asking questions and found that not a lot was known about the engines or the company itself. Since then I have accumulated some 14 Turner diesel engines (4off 1V95, 2off 2V95, 4off L40 and 4off L60) and made contact with a former employee of the company who has a keen interest in their various products and who will be assisting me in content for this site. Relatively recently (June 2015) I sold my 1V95 marine engine so my collection is down to 13 units. This site will expand over time I welcome contact from anybody with an interest in any of the products of the Turner Manufacturing Company. I would like to acknowledge the amount of information already published or retained i.e. web sites such as the Wolverhampton History & Heritage web site: Graces Guide: Wiki-tractor & construction machinery: Black Country History: and collections such as Wolverhampton Archive and MERL. [With apologies for any omissions!]. Initially I will re-post content which appeared on my former site and this will be developed in to something much bigger and covering all products of the Turner Manufacturing Company. We would be delighted to hear from owners of any Turner Manufacturing Company products, please use the E-Mail button above. This site does contain images posted elsewhere and I would like to acknowledge that this is the case. If the owners of these images wish me to take them down from this site then please get in contact.